If you’ve seen James Marsh’s “Man on Wire,” then you know of Philippe Petit’s dazzling tight-rope walk between the towers of New York’s World Trade Center on the morning of August 7, 1974. What you probably don’t know is that while Petit was criss-crossing back and forth between the towers for roughly 45 minutes, Michael Shannon was coming into the world down in Lexington, Kentucky’s Good Samaritan Hospital. “I don’t think it means anything,” Shannon says. But it’s certainly an interesting aside to the Oscar season, drawing a connection, however meaningless, between these two contenders, one of them a thoroughbred frontrunner, the other deserving of that consideration but strangely under the radar this year. When Shannon walks into a room, his striking height seems to command at least a glance in his direction. A couple of brunching patrons stare for a bit, sure that they’ve seen him in SOMETHING before. And for a number of years, Shannon has been that kind of actor — the hard-working sort that AMPTP has certainly disavowed as SAG tries to find some sort of plan for sustaining the acting middle-class throughout the industry. You’ve seen him in “Pearl Harbor,” “Bad Boys II,” “World Trade Center,” “Bug” and any number of bit roles that call for the unusual image he cuts. 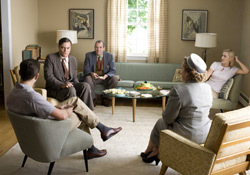 But you’ve never seen him like he is in “Revolutionary Road,” a two-scene wonder of a performance that cuts the the very core of a narrative already concerned with getting at the hardest of truths. Shannon likes Hugo’s, taking a glance around the room. But it’s clear he’d probably rather go someplace without “organic” peppered throughout the menu. I point out James Cromwell reading a book in the stall next to us and Shannon manages a “Holy moly” before going back to the menu. His cadence is conversational but direct. If he blinks he does it when you’re not looking because when he’s engaging with you, his eyes never leave yours. He’s visiting on this west coast trip with his wife and newborn baby; they’re New York-based, though Shannon did his time in the Silver Lake neighborhood of Los Angeles at the turn of the century. He pulls out a battered photo of the tight-knit family. “That’s the triumvirate,” he says, closing the menu…I feel like he never looked at it, though. When the food arrives, I immediately regret my order. Shannon’s chilaquiles look a lot more enticing than my go-green fritata, something more akin to a regurgitation than an ediable breakfast. The conversation drifts in and out of his pivotal role in Sam Mendes’s film, but for the most part, it’s difficult to talk business. Shannon has the aura of a guy you’d rather be having a few beers with than interviewing in any formal setting. Just a few weeks ago he was doing just that, chatting with a few press members at a lavish dining table across the street from Paramount’s studio lot on Melrose, just after an early screening of “Revolutionary Road.” There, he seemed slightly more in his element, taking turns with pot-shots at our Commander-in-Chief with an affable Leonardo DiCaprio and introducing himself with a gee whiz “Hey, I’m Mike” to all comers. He doesn’t have any elaborate story to describe his road to the acting profession. He took a few courses in high school, turned down a free ride at Duke University in North Carolina (where his father teaches) and went his own way. He just liked performing and didn’t want to go any terribly formal route with it. Soon, he made his way to the Chicago acting scene, a hot-bed of the trade with such industry staples as Gary Sinise’s Steppenwolf Theatre Company. Shannon later made the trip to London’s West End, where he took a number of renowned roles, including the complex lead in Georg Büchner’s “Woyzeck,” which director Werner Herzog brougth to film in 1979 with Klaus Kinski in the part. Interestingly enough, Shannon just wrapped shooting on Herzog’s “Bad Lieutenant” remake down in Louisiana, an experience the actor says he cherished, however brief. He’s also just wrapped Géla Babluani’s “13,” which saw him in a room with Mickey Rourke for a time. “Did you get to see him?” he asks me, what with Rourke doing the publicity tours this year for “The Wrestler.” There’s a definite note of awe at the troubled actor in his voice, and soon he betrays that note, singing Rourke’s praises as someone whose work he greatly admires. If it sounds like a wandering narrative, that’s kind of what it’s like with Shannon. One never feels the need, nor the desire to pull out the trusty audio recorder because it might ruin the brief glimpse of a real conversation in the flurry of the put-up and put-on encounters with which this time of year has become synonymous. 1974, right? I haven’t seen Man on Wire, but he can’t possibly be 44? Great guy, and my favorite part of the otherwise irredeemable Before the Devil Knows You’re Dead. Do you mind if I call you Paco? Sorry Kris for being off topic, but I didn’t know if you had noticed this. Wouldn’t it be such a great and emotional moment at the 2009 Oscar ceremony if Javier Bardem, winner of last year’s best supporting actor award, presents the award for best supporting actress to none other than his main squeeze, Penelope Cruz? Yeah, I’ve heard some discussion of that. I think it’d be great. And it’s certainly likely at this point. That’s interesting about the “Man on Wire” incident. Exceptional film, too. 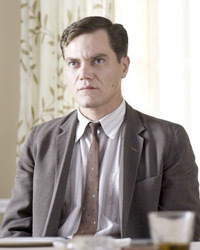 Good lord do I love Michael Shannon. Definetly one of the best actors working today. ‘Shotgun Stories’ was my favorite movie of the year by far. You’re so lucky, Kris. I saw Rev. Road tonight, and Bug last night, so you can imagine how big of a Shannon fan I am now. He should’ve been nominated for Bug, it’s a shame everyone loathes that film. If there could be six nominees this year I’d throw him in, your supporting line-up is the same as mine. Me too always been in awe of Rourke when he has a real role and not in some crap B movie.The media often craps on Rourke but to a man actors revere him. I’ve read that Shannon is also starring in Herzog’s next film. A well-written interview, but there’s not enough interview there. I wanted more from Shannon. He’s an enormously interesting guy and a great actor, and I wanted to hear more from him.